Once reluctant to get involved in his party's 2016 presidential primary, Gov. 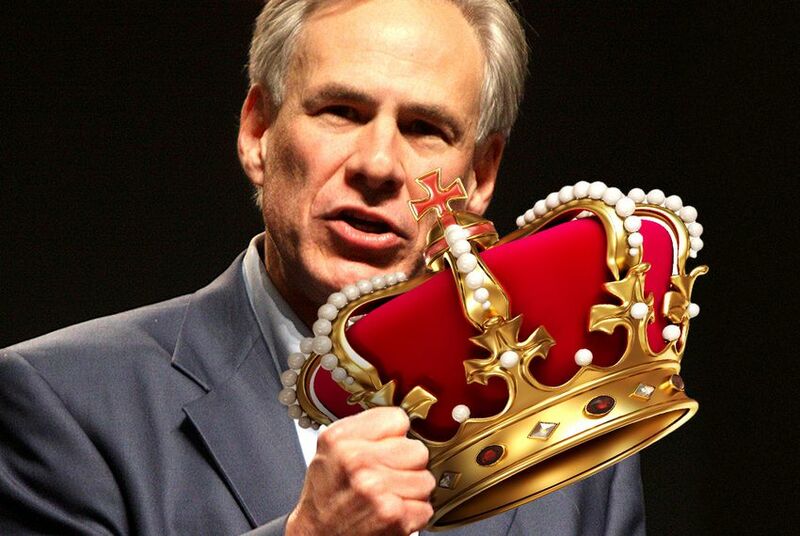 Greg Abbott is increasingly warming up to his potential role as a kingmaker. Gov. Greg Abbott, once reluctant to get involved in his party's 2016 presidential primary, has a new message for White House hopefuls: Get in line. With Texas poised to play a role in determining the GOP nominee for the first time in decades, the first-term governor is increasingly making clear he does not plan to let the newfound clout go to waste. He's laid out five criteria for the candidates and wants them to come see the border that has been central to his agenda so far. Abbott has not decided whether he'll endorse before the Texas primary on March 1, a date that puts the state earlier than usual in the nominating process. That has not stopped him from leaning into a potential role few of his predecessors in recent history have had the chance to play: presidential kingmaker. "Gov. Abbott believes the next president should be a committed conservative who will embrace and uphold the United States Constitution, starting with doing what the current administration has failed to do in securing our border," Abbott spokeswoman Amelia Chasse said in a statement. "He looks forward to the national conversation that will take place during the upcoming primary process." In addition to a constitutional conservative who will secure the border, Abbott wants a candidate who will let Texas access Medicaid dollars through block grants. And he would like the next president to eliminate the Environmental Protection Agency and the Department of Education, or at least weaken their hold on the states. Campaign pros say it is a no-brainer for Abbott to grab the 2016 spotlight, even if he ultimately passes on an endorsement. "I think a lot of political leaders in Texas will keep their powder dry and help frame that debate when it comes time," said Dave Carney, a New Hampshire-based Republican strategist who advises Abbott. "I think it just makes perfect sense." Depending who is still in the race in the run-up to the Texas primary, Abbott could find himself torn between multiple allegiances. He served as attorney general for 12 of the 14 years Rick Perry was governor. U.S. Sen. Ted Cruz, the former solicitor general of Texas, counts Abbott as a mentor. And while Abbott is not as close to Jeb Bush, his family's roots run deep in a state that is home to two former presidents. It was a dilemma not lost on Jim Geraghty of the National Review after Abbott visited the influential conservative outlet's offices for an off-the-record chat during a recent trip to Washington, D.C.
"In short, by endorsing one, Abbott would do some damage to his relationship with the other two; the media both nationally and in Texas would interpret an endorsement of one as a slap in the face of the other two," Geraghty blogged a day later under the headline "Greg Abbott Could be a 2016 Kingmaker — But He May Not Want to Be." In any case, Abbott's current designs on 2016 are a shift from just six months ago, when he flatly said on NBC's Meet the Press that he was "staying out of the primary." Back then, he had not taken office yet and the presidential race was just beginning to heat up. More recently he's warmed up the idea, teasing out his thoughts on 2016 in a series of interviews. He told conservative radio host Hugh Hewitt he expects the "rule of law writ large" to factor prominently into the race. And he laid down the gauntlet last month while speaking with another GOP talker, Laura Ingraham, saying he will "be working as strongly as I can to oppose anybody who is not going to first secure our border." Wisconsin Gov. Scott Walker was the first — and, so far, only — White House wannabe to take up Abbott on his offer to visit border. The tour, which was closed to reporters, lent Walker some credibility at a time when some conservatives were growing skeptical of how tough he was on illegal immigration. A day after the tour, Abbott and Walker appeared together at the Harris County GOP's Lincoln-Reagan Dinner, where Abbott praised Walker as a "man who governs like a Texan" and playfully noted that Walker has won the Wisconsin governorship three times despite the fact no GOP presidential candidate has carried the state since 1984. More recently, Abbott has had kind words for Louisiana Gov. Bobby Jindal, whose stump speeches often feature him saying, "America did not create religious liberty. Religious liberty created America." Two weeks after approvingly tweeting the quote, Abbott worked it into his speech to the National Catholic Prayer Breakfast in Washington, D.C.
Abbott also is friendly with Carly Fiorina, the former Hewlett-Packard CEO who campaigned with him last year as he was seeking to show he could hold his own among female voters against Democratic foe Wendy Davis. Fiorina, who was born in Austin, had previously endorsed Abbott. Whomever Abbott settles on — if he settles on anyone — his endorsement could provide just the boost that candidate would need to emerge from a crowded field in a state with no shortage of presidential timber. “Anytime you get the endorsement of the governor of the state, it is a big deal," said Steve Munisteri, the former chairman of the Texas GOP who is now advising U.S. Sen. Rand Paul, R-Ky. "It’s a big deal because not only does it lend credibility to a campaign, but it also gives the impression of momentum, and with the governor’s office in particular, there’s such a network of support." Patrick Oxford, a Houston lawyer who has known Abbott for decades, said he sees the governor playing less of the role of kingmaker than conversation-starter. "He could have a lot of influence, but I don't think he will choose to exert a lot of influence except to keep it focused on what Texas wants," Oxford said, predicting Abbott will be more likely to "tee up" issues that matter to Texans than ultimately throw his support behind a single candidate. Abbott has suggested he sees the potential role as a serious responsibility given Texas' place in the nominating calendar. Yet he is also having fun with the prospect of being mentioned in the same breath as traditional power-brokers in states like Iowa, New Hampshire and South Carolina. "I am trying to get all the presidential candidates to come to Texas," Abbott told Ingraham. "Heck, I'll even give a tour to Hillary Clinton."